Japan has always been a country associated with design, atmosphere and tranquility. The abundance of these elements in the country only serves to highlight the lack of said elements in ours. But as is the case with many Westerners, I am a great admirer of all things Japanese, from the food to the architecture, and try to incorporate these aspects of the lifestyle into my own life. This obsession with the country has led me to create a list of fish tank decorations that reflect the Japanese culture, whether it be through the design or function of the item. But one thing that all of the items have in common is that they provide a taste of the culture of this great country, and hopefully can bring some tranquility to your own life, and to the life of your fish! So without further ado, let me introduce the list! 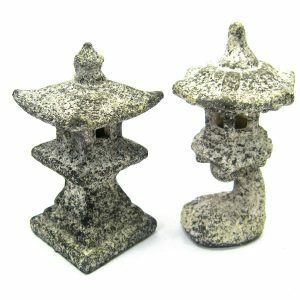 These beautiful ceramic ornaments are an excellent example of Japanese design that you can use to decorate your own fish tank. As you can see from the image above, the ornaments aren’t too huge, so won’t be too imposing or take up too much of your fish’s space. We love this item because it is made from material that won’t harm or upset your fish, and will be safe from algae or mould in freshwater or saltwater. We think you guys will love this item, so to check it out click on the green button above. This item has free shipping which is just another perk that makes it really awesome. How often have you dreamed of having your own little place where you could get away and just forget the world for a bit? 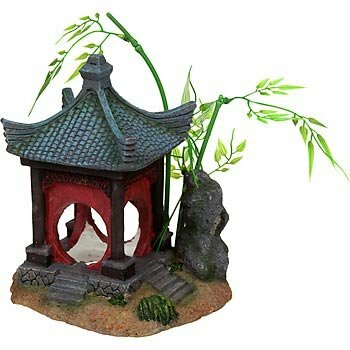 Well now you can embrace the Japanese way of life and get this cool gazebo for your fish tank! 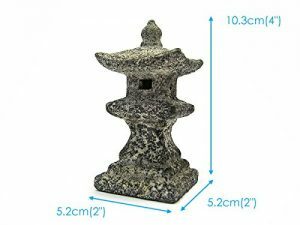 We love this item because of the great detail and reasonable size that make it a perfect addition to any tank. You know what we think of it, but there are also a ton of other people over on Amazon who dig this little gazebo as much as we do. Click on the green button above to check the positive reviews out! Growing miniature trees like the bonsai tree has been a Japanese tradition for thousands of years. 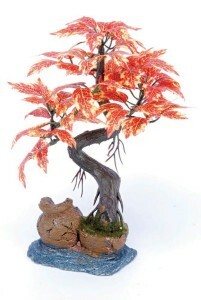 Now you can add these little guys to your fish’s tank, and turn them into a bonsai buff. We love this item which has always been a popular item on our site, because it can add some much needed foliage to your tank, which can add extra hiding places and coverage for your fishy friend. This is another item that has a load of positive reviews over on Amazon, so click on the green button above to check them all out! So there we have our list of decorations inspired by the culture and design of Japan! As you can probably tell, I have a genuine passion and interest for this country and the Oriental lifestyle, and I hope that is reflected in my choices of items that I added to the list shown above. As always, we choose the items that we add to our site based on the overall quality of the item, the value for money of the item and the average customer rating of the item (choosing highly rated items). We hope that the products shown above tick all of these boxes for you! We like to remind you that if you encounter any problems with your order, you should try to contact the seller directly over on Amazon. Their details can be found by clicking the green button below the item that you wish to return. If you struggle to find their details, you can drop us an email directly and we will try our best to get a hold of them. We use Amazon because they are a trusted brand, and you can be safe in the knowledge that your item is being handled by a professional and trustworthy team. FishTankBank is happy to be associated with the products above, and always welcomes your emails. Feel free to browse the rest of our site to see if you find anything else you fancy!